Strength and Conditioning (S&C) underpins everyone’s training program, allowing them to perform better, prevent injury and improve bio-mechanics in their chosen sport or discipline. 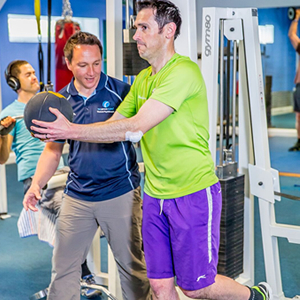 At The Physio Clinic Bristol we have a team of Strength and Conditioning (S&C) Coaches that can tailor and structure your training programme to help you achieve greater performance whilst staying injury free. What is Strength and Conditioning (S&C)? Strength and Conditioning (S&C) is the development of an athlete or individuals performance using the various components of fitness, allowing them to become Faster, Stronger and more Flexible whilst remaining Injury Free. What are the Components of Fitness? There are 9 components of fitness that will be integrated into your tailored Strength and Conditioning (S&C) Programme at The Physio Clinic Bristol (not necessarily straight away), giving you the very best chance of achieving your goals Effectively, Efficiently and Safely. What can YOU expect from Strength and Conditioning (S&C) at The Physio Clinic? You can expect high quality, Individualised Programming and Coaching/Lifting Sessions lead by highly qualified and experienced Coaches. 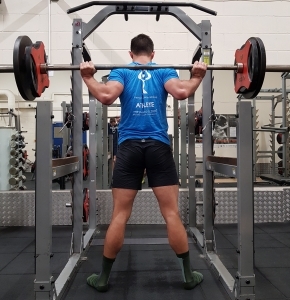 You will receive Training Programmes based on your goals and ability along with expert Coaching and Instructing, so you can be sure that you will have good Lifting/Movement Technique, Posture and get the most out of your training whilst Avoiding Injury. At The Physio Clinic, we know every person is different with different objectives. Your Individualised Programme will be based on Needs Analysis and guided by Technical, Medical and Scientific Evidence. To ensure Performance Progression, our Strength and Conditioning (S&C) Coaches will rigorously Analyse, Evaluate and Monitor your Programming and Technique- modifying your programme and training needs accordingly on a regular basis. What does the Strength and Conditioning (S&C) at The Physio Clinic require from you? We do the Planning. You do the Work. You see the Results. To get the most out of your Individualised Programming, YOU have to be prepared to Work Hard if YOU want to Achieve YOUR Goals and Enhance YOUR Performance. Commitment and Consistency to your training is key! How does Strength and Conditioning (S&C) differ from Personal Training (PT)? 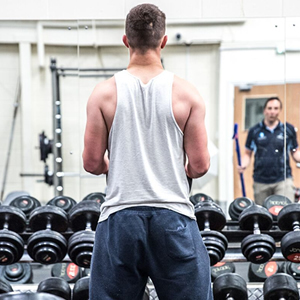 Strength and Conditioning (S&C) Coaches work with Individuals, Athletes, Sporting Teams or Clubs to improve the performance of the Athletes, keeping them Healthy, Injury Free and to get them in the best possible shape so they excel in their sport. Coaches will develop Training Programmes to develop Strength, Speed, Power, Size/Mass, Agility and Recovery so the Athlete/Individual performs at their best. At The Physio Clinic, we want to bring the services Elite Athletes receive- TO YOU, SO YOU CAN REACH YOUR FULL POTENTIAL. How is this different from personal Training (PT) or a Gym Program set by a Gym Instructor? The frequency of Personal Training (PT) sessions is often weekly or less which can be costly. 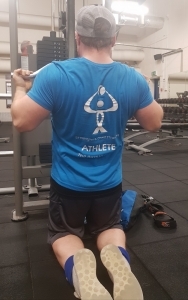 Whist we can offer this type of motivational service, Strength and Conditioning (S&C) Coaching is designed to Empower and Educate the individual with their training. The One to One Coaching Sessions are a way of introducing new exercises and ensuring correct Lifting Technique both during the session and afterwards, when unsupervised training occurs. Your coaching doesn’t stop once the session is over. Our service gives every Strength and Conditioning (S&C) Client Multiple Workouts/Training Plans, allowing exercise variety and making each session enjoyable and also prevent Training Plateaus. Simple/Basic Gym Programs generally try to improve the 3 basic components of fitness: Strength, Stamina and Flexibility with mixed levels of success. Our key our to success, is to deliver Quality Coaching and a Commitment to Deliver the Most Professional Service Possible. To ensure Performance Gains/Progression, our Strength & Conditioning (S&C) Coaches are rigorous in Evaluating, Monitoring and Improving YOUR Technique. We are not just there to just count reps and let you get away with poor technique. What are the prices and services you offer? Call 01454 85 44 66 and book a Strength and Conditioning session.